Jaded Blossom: You are Amazing Gift Set! Hey, it Melissa from M Miranda Creations and today I am excited to share this fun gift set with you! 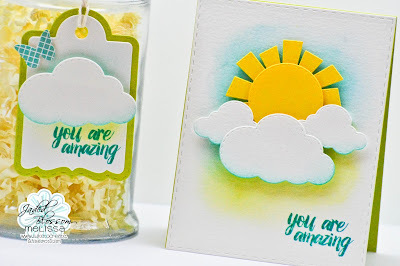 I used several Jaded Blossom goodies including Spring Dies 2, Rectangle Dies 1, Treat Tag Die, and a sentiment from Encouragement. I also used Canson Watercolor paper, Peacock Feathers and Crushed Olive Distress Inks, and Limeade Ice cardstock from Papertrey Ink. Thanks so much for stopping by! Don't forget to share your fun projects with us in the Garden of Creativity on Facebook. Love this! Great color combination and adorable creation!